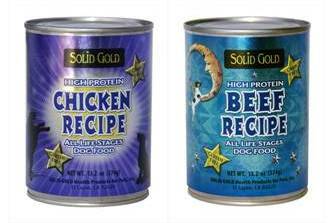 Solid Gold Health Products For Pets is pleased to introduce two new high protein, grain and gluten free canned dog foods. Chicken Recipe and Beef Recipe can be fed as a sole diet or as an excellent accompaniment to Sun Dancer™ and Barking at the Moon™. Solid Gold never uses any soy, wheat, corn, sunflower or safflower oil. Solid Gold Health Products for Pets, specializes in the development of non-allergenic products for dogs and cats. Ingredients are chosen to work together to, enhance total health, boost up the immune system and protect against disease. We are happy to assist you in choosing food for your pet, please contact us with any questions. Find a Northland Retailer near you.